What happens if you want to keep growing your economy, but you are running out of resources on the land? Or, you are an island nation, and you don’t have much land? You look to the sea. That’s what many countries are doing, big and small, island and coastal. And that’s why the phrase “Blue Economy” — the economic development of the oceans, seas, and coastlines — has been spreading with great speed, around the world. Here in Europe, it’s called “Blue Growth,” and the EU has a special strategy for it, looking at economic sectors such as aquaculture, coastal tourism, shipping, and of course undersea mining. Oh, haven’t you heard about undersea mining? Globally, it’s the next big thing. Machines are being developed that can be dropped to the ocean’s bottom and crunch it up to get the valuable minerals there (one of these machines is called, affectionately, “the Beastie”). A new International Seabed Mining Authority is already granting licenses to companies, for big tracts of undersea land. Interestingly, some of the companies that are pursuing these undersea mining opportunities are financed by billionaires who live in countries that are … let’s just say, these folks are not well known for caring about what happens to the planet. The rapid growth of undersea mining is just one example of why we need some clear definitions and guidelines, and eventually stronger laws, about how to make the Blue Economy sustainable. Because if we’re going to create a “Green Economy,” we have to do it in a “Blue” context, too. And that’s why AtKisson Group was so happy to work for the World Wildlife Fund (WWF) over the past year, helping WWF to develop a new set of Principles for a Sustainable Blue Economy. The result of nearly a year of consultation, these new Principles are now ready to be spread around the world, to help governments, NGOs, companies, and citizens come to grips with this new “Blue” opportunity. The sea is vast … but we humans have already managed to wreck it in various ways. If we’re going to use the sea’s resources to lift people out of poverty, and to keep feeding the engine of our economies, then we had better change the way we do business there … before we even get started. And we have just one chance to get this right. Are you interested? Is helping to save the sea, and use it responsibly, important to you? Then please, download the Principles — and start putting them to work. 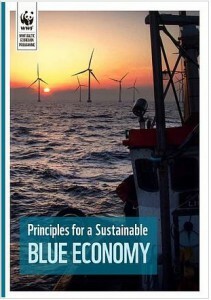 The Principles for a Sustainable Blue Economy are a WWF product, to which AtKisson Group provided extensive strategic and editorial consulting support, working on assignment to the Baltic Ecoregion Programme and WWF Sweden (on behalf of WWF International). For more information about this project, write to blue [at] atkisson.com.